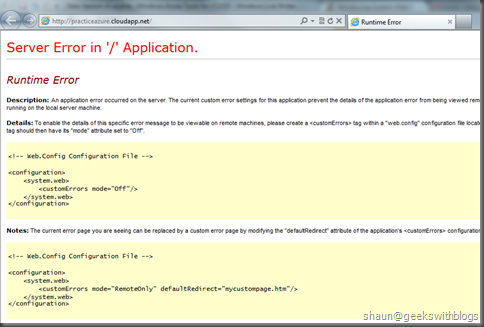 Profiling the application running in Windows Azure. New ASP.NET MVC 3 web role template. 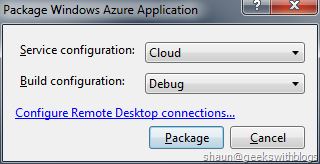 Multi-configuration files in one cloud project. More validation in the service package and deployment phase. 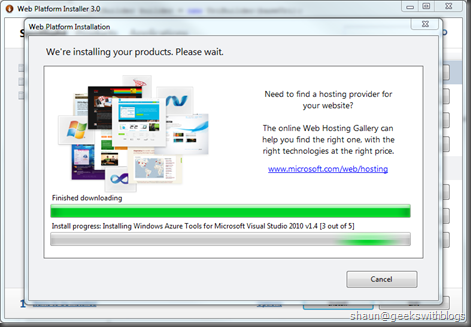 To install the Windows Azure Tools for VS2010 - August Upgrade you need to visit here, where using the Web Platform Installer to download and install. Currently there’s no standalone package available. 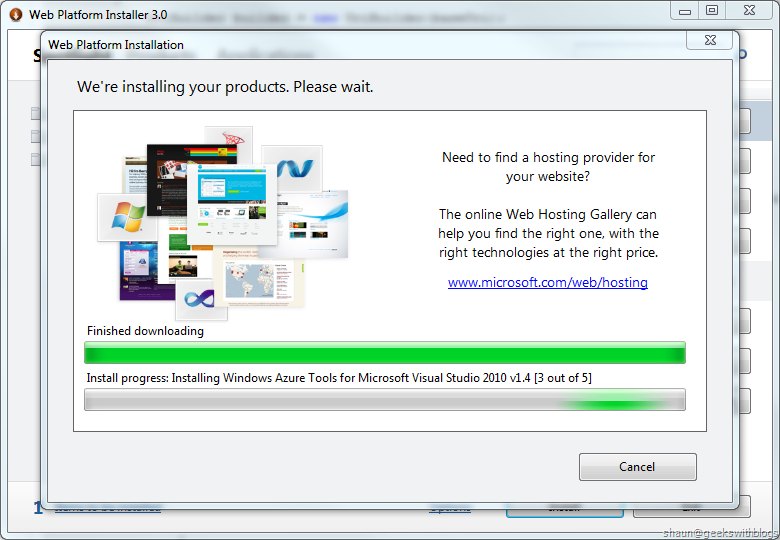 The WebPI will download some dependency packages besides, such as the latest Windows Azure SDK, ASP.NET MVC 3 for Windows Azure, etc. 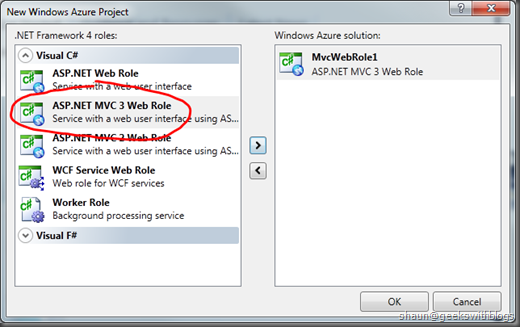 After you installed the package we can find the new ASP.NET MVC 3 Web Role template available when creating a new cloud project. 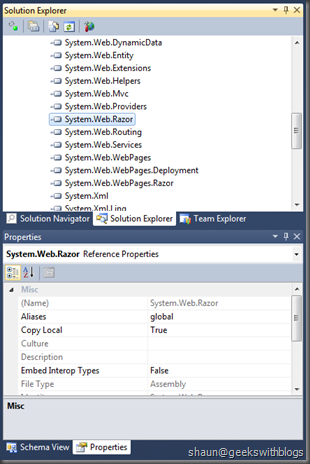 In the solution explorer we can see the ASP.NET project had been created with the new Razor view engine and HTML5. And the assemblies related to MVC3 are all added and set the Copy Local = True by default. And we can just press F5 to run the application under the local emulator. This is another good feature added in this upgrade. As a developer, normally we need to use different settings between development and deployment. For example, when developing in the local emulator I uses the local storage emulator, local SQL Server with 2 web role instances. But when deploying to the cloud I need to use the storage service, SQL Azure and 4 instances. This means I need to tweak the service configuration everytime deploying to the cloud. And this could be more complex if we have more environment such as development, local testing and cloud. The Multiple Service Configurations feature can make the job simpler. With two configuration files enabled, we can choose which one will be the service configuration file when locally debugging, packaging and deploying. 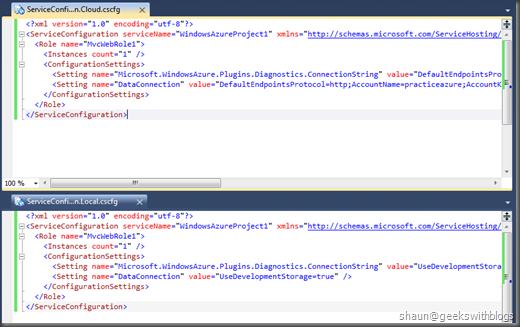 This means we can set different values in different file between local and cloud environment. In the service setting windows, find the Service Configuration section, where we will choose which CSCFG file is going to be edited. And if I need to edit the Service Definition file (CSDEF) just select the All Configuration. Let’s firstly select the All Configurations and navigate to the Settings tab to add the connection string to the storage the application is being used. And then select the Local under the Service Configuration, we will use the storage emulator when locally developing and debugging. Next, select Cloud and specify the storage account information when deploying to the cloud environment. And if we opened the two CSCFG files we can find the settings had been updated in the related files. If we need more service configuration files just select the Manage menu under the Service Configuration dropdown and create a copy from one of the existing. For example, I added a new configuration named TestServer which will be used when deploying to the local test server. 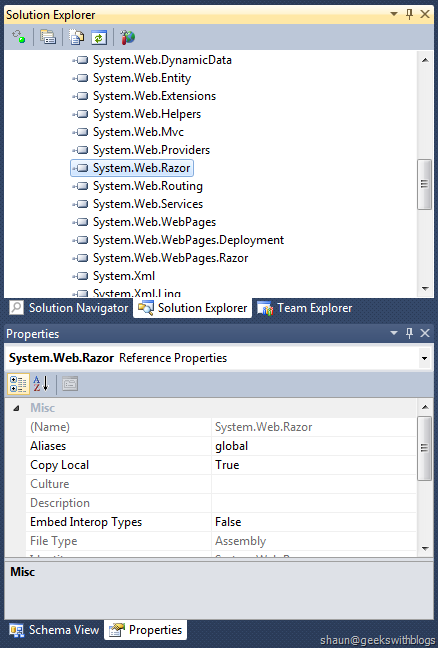 And in the solution explorer a new CSCFG file had been created as well. 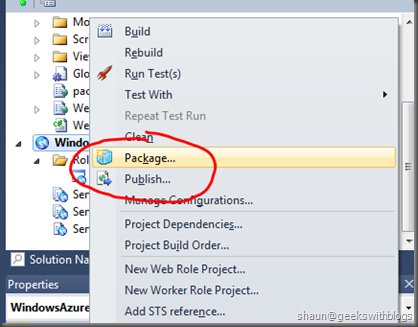 We can choose which configuration file should be used when debugging under the Visual Studio. Just right click the cloud project and open its property window. In Development tab we can choose which configuration should be used. 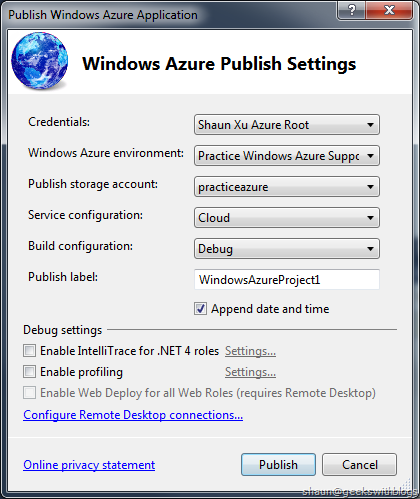 In the previous tool we choose to package or publish our windows azure project by selecting the radio button in the Publish window. In this upgrade the package and publish had been totally separated. 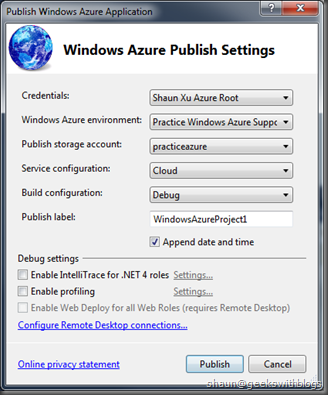 In the context menu of the windows azure project we can create a package by using the Package menu, and use the Publish menu to deploy the application directly to the cloud. 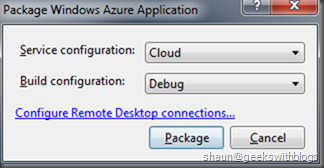 In the package window we will be asked to select which service configuration should be used, which build configuration should be used and whether to enable the remote desktop. In the publish windows, similar as what we did before, we need to select a proper management certificate, hosted service, storage service, and the service configuration, build configuration as well. We can also enable the IntelliTrace if we are using .NET 4.0 and VS2010 Ultimate, and enable the profiling feature, whcih is new in this upgrade. The different environment between the development machine and cloud instance introduced more work when first deployment. We need to verify which references should be set to Copy Local = True and which configuration should be changed. I also introduced a website which can help you to do the validation in this post. 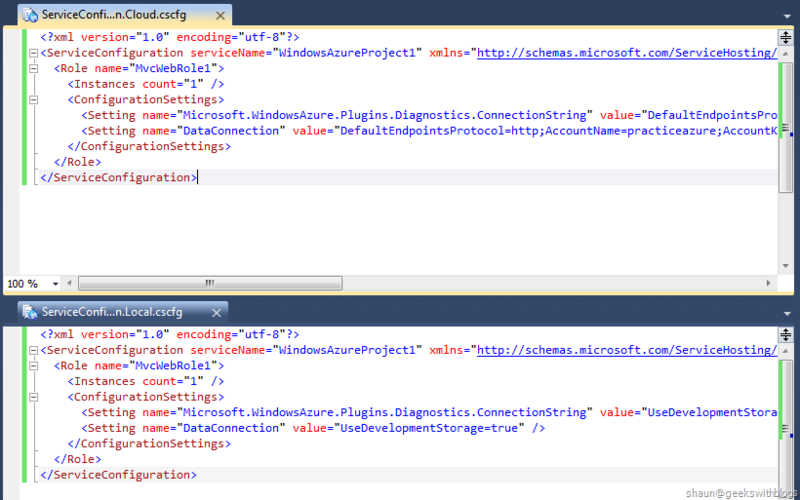 But now the Windows Azure Tool helps us to validation the project. 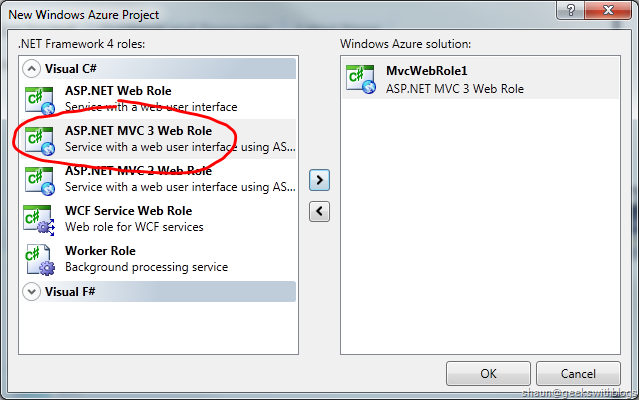 If we just publish this ASP.NET MVC3 web role to the cloud, we can see there is a warning in the error window said we are using a local database which might cause problem after deployed in the cloud. And not only validating the database connection string, if we added some references which out of the .NET Framework package it will bring an error to indicate us to set the Copy Local = True on them. 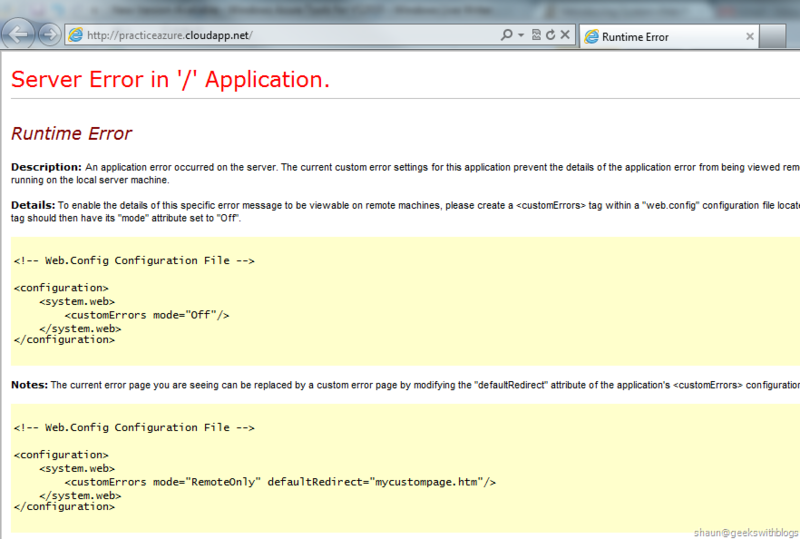 After deployed the ASP.NET MVC 3 application to the cloud we can open the website, but there’s an exception occurred. This is because the ASP.NET MVC 3 application utilizes the ASP.NET Universal Providers, and it uses the default session state provider in ASP.NET Universal Providers as the ASP.NET session state provider, which means leverage the SQL Server to store the sessions. To solve this problem, we can specify a proper SQL Azure connection string in web.config; or we can just use the InProc session provider if no need to scaling-out. The ASP.NET Universal Providers extends the Session, Membership, Roles and Profile support to SQL Compact Edition and SQL Azure, which means as a developer, we can implement the business logic regardless which backend database we are using. For more information about this cool stuff please check the Scott’s blog post. 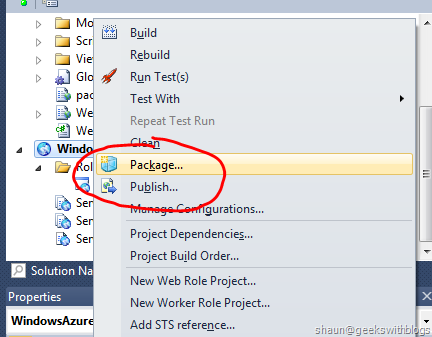 After fixed this problem we can see the ASP.NET MVC 3 application running in the Windows Azure. The team is keeping improve the tools of Windows Azure Platform by listening the voice from the developers, to make it more convenient and simpler to work with Windows Azure. In this upgrade of Visual Studio Tool it brings not huge but many useful features to us, such as multi-configuration and ASP.NET MVC 3 web role. I personally strong recommended to upgrade to this version.